Just the other day, I watched the Republican debate. It was being billed as dogfight and it didn’t disappoint, with Donald Trump deriding Rand Paul for having a ‘hard night’ and Marco Rubio audaciously stating that the Democrats can’t even find one good candidate. A notable omission from the broad set of questions thrown at them was the issue of Climate Change. Here’s where they all stand on it. Jeb Bush accepts it’s happening, but he’s less certain about whether humans are doing it or not, which is odd because it’s been nearly two years since the UN confirmed that human activity is the main driver behind global warming. Ben Carson thinks that the whole debate is ‘irrelevant’ which is fairly tragic if anything. Chris Christie acknowledges global warming is real and man made. I am happy that at least one Republican is talking sense on this. Ted Cruz claims that ‘in the last 17 years, there’s been zero warming’ which is simply him spreading misinformation. Mike Huckabee thinks that Climate Science is not settled yet, despite the facts being pretty comprehensive. John Kasich thinks Climate Change is real and is a problem but also thinks that the Environmental Protection Agency (EPA) should not regulate emissions, which leaves me very confused on how he would intend to protect the environment. Rand Paul is “not sure anybody exactly knows why” Climate Change is happening. Well Rand, 97%* of scientists do. Marco Rubio doubts manmade global warming because ‘the climate is always changing’. While the climate is continually changing, the graph below illustrates he’s shying away from some basic facts. 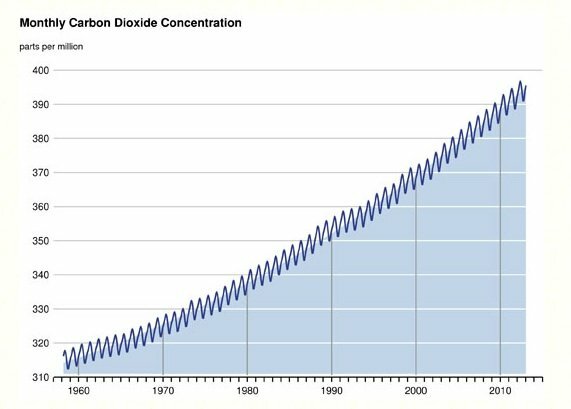 Skeptics are right when they say that CO2 concentration fluctuates. However, as illustrated by the graph, there’s a very clear and worrying trend. And that’s that it’s going up. Donald Trump posted on Twitter that ‘The concept of global warming was created by and for the Chinese in order to make US manufacturing non-competitive.’ I’m not sure that this even warrants a sincere reply. And finally, Scott Walker signing a ‘no climate tax pledge’ suggests he’s probably denying it. He’s definitely against stopping the problem, that’s for sure. That makes for some very depressing reading, huh? The worst part is that I’m sure some, if not most of these Republicans know they’re buying into a scam. Big money interests such as the Koch Brothers, who have decided on spending close to $900 million on the 2016 election have long gone out of their way to oppose climate change legislation . This is because a lot of their wealth is generated through the distribution of coal and petroleum, which isn’t exactly renewable energy. This is harmful because only 21% of Republicans view Global Warming as a ‘serious problem and these candidates are doing a good job of trying to keep that figure low. An Inconvenient Truth by Al Gore (imagine if he was the President of the United States) explains the monumental scale of the problem at hand. If you’re interested in learning more about Climate Change and its effects on the environment, then I strongly recommend you watch the film. Protecting our planet can and must be a priority. *This figure is contested but if it’s not 97, I can assure you it’s still and overwhelming majority. Previous Post Does immigration help or harm the UK economy? This is from a group of individuals that doesn’t believe in evolution. That everything that started in 4400 B.C. And that just down right hates science. Someone should ask them about labeling GMO products. But everything was focused on becoming the next Donald Trump without his bombast. ‘Course this is the same group of people who believe that the stork brings babies. That must be true because these same people want to get rid of artificial contraceptives. One wonders how any of these guys ever got anyone to marry them. Ugh. Sometimes I hate Americans. And being one of them. Watching American Politics during primaries can be hard, with each one of them trying to charm the base. But the real trick is after the primary, they have to modify their positions to make themselves acceptable to the majority. Watch – you’ll see that Trump will never get higher then the 20-30%. Same with Hucklebee and the other knuckleheads. Jeb Bush may be the most viable candidate of the lot, but he has to separate himself from his family. I don’t even need any scientists to tell me. The way I look at it is this: The last ice age was about 12,000 years ago. The population of the Earth at the time was about a million people. Here we are now with 7½ BILLION people, cars, trucks, manufacturing…….all things that didn’t exist 12,000 years ago, so how could we not be having an effect on the environment? May I just say what a comfort to discover someone that actually knows what they aretalking about on the net. You certainly understand how to bring an issue to light and make it important.More people need to read this and understand this sideof your story. It’s surprising you’re not more popular given that you certainly have the gift.